His literary investigation into the network of prison camps that existed in the Soviet Union from 1918 to 1956 is now part of the school program, an event that has excited much debate. Some say that this masterpiece will bore teenagers. Others worry that the terrible truth contained in it will traumatize young readers. Journalist and historian Nikolai Svanidze has his own opinion. By order of the Russian Ministry of Education and Science the school program for 20th century Russian literature will now include excerpts from Aleksandr Solzhenitsyn's The Gulag Archipelago. This is not merely good or desirable - it is essential. The Gulag Archipelago, a portrait of the terrible terror machine, is a moral reference point for the study of the recent Soviet past. This is a work without which a person cannot grow up to be a citizen of Russia. It can be studied in two disciplines at once: history and literature. At any rate, adolescents will learn about the roots of things and what was going on in their country long before Putin became president. Of course, there is a distinct danger: will the 16-year-old's eyes glaze over when he or she opens this huge tome? After all, even War and Peace (also required reading) is increasingly skimmed, rather than read carefully. Yes, it will require a certain effort. That, I think, is inevitable: school students must learn to read books. Today teenagers see any reading not as a pleasure, but as hard work. Such are the times and the customs today. And so long as they don't care which book bores them, then better let them be bored by The Gulag Archipelago. Teachers and those in charge of the literature program should pick the strongest parts so that school students retain the crux reflected in Solzhenitsyn's phrase: "In the whole world and in all of history there was never a regime more evil and bloody and at the same time cunningly disingenuous than that of the Bolsheviks." Solzhenitsyn is an extremely complex figure and to explain to schoolchildren all the zigzags of his thinking and all aspects of his exceptional character would be difficult. But much of what has to do with our history will have to be explained. For instance, where to search for the roots to the terror? If not for the Red Terror of 1918-1920, most likely there wouldn't have been Stalinism. Although in some ways these two things were radically different. Lenin was an internationalist and definitely not an anti-Semite, like Stalin. Lenin did not butcher his Party comrades, as Stalin did, but he butchered everyone else with pleasure. After the Revolution, Stalin adopted many of the ideas of his rival Trotsky; for instance, in what concerned the peasantry. But after that he began to improvise. Until the end of the 1930s Stalin was taking a lot from Lenin and Trotsky, but from the beginning of the `40s, and especially after World War II, he was a student of Hitler's. Early Solzhenitsyn, One Day in the Life of Ivan Denisovich (the struggle of one prisoner to survive a typical day in a Stalinist labor camp) and Cancer Ward (about patients in a provincial cancer ward coming to terms with their impending death), is ideally suited to school study. But with age, Aleksandr Isaievich complicated his writing style and acquired his own language. The works of the late Solzhenitsyn are clearly not for school. On the other hand, Solzhenitsyn has philosophical ideas that need to be understood. In The First Circle (about a prison for well-educated persons who conduct scientific research while serving long terms), a young man faces a moral dilemma. He knows that Soviet intelligence in the United States is about to get the secret of the atomic bomb. However, he feels that a regime like his should not have the atomic bomb because it would pose a threat to all mankind. He decides to tell the U.S. Embassy. That is, he betrays his country according to all written laws. Not only Soviet laws, note. American laws, too. Still, this character commits treason not out of self-interest, but out of conviction, as a man of principle, a humanitarian and, unquestionably, a patriot of his country, though not of the Soviet system. Did he act rightly or wrongly? This is the sort of question that could be put to teenage readers of Solzhenitsyn. I wonder what they'll say. One teacher might say: all right, so we give the children The Gulag to read, show them how awful everything was. But we need to juxtapose this with a positive example! Otherwise the historical consciousness of a generation will be traumatized. To find an ideal in ourselves is hard for us, we have such a bloody and tragic history. And we certainly won't be able to study these events from the point of view of Benkendorf (head of the secret police under Nicholas I) who said that the patriotic historian must write that: our past is glorious, our present brilliant, and our future beyond all expectations. Russians should take pride not in the imperialist power that produced dubious fruits and twice in the course of the 20th century led to the collapse and death of the state, but in Pushkin, Chekhov and Tolstoy. Russian culture is indisputably an object of Russian pride. As for our history, then the people, those who endured all that is described in The Gulag and crushed Nazism to boot, can take pride. I think that an intelligent teacher will be able to put the matter that way. This article was first published in the newsweekly Itogi (21 September 2009). 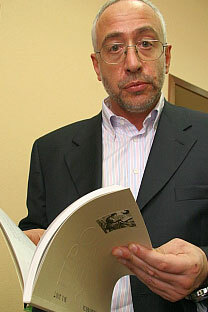 Nikolai Svanidze is a Russian television journalist, political columnist and TV host. He is a member of the Public Chamber of the Russian Federation. As of 2009 he is also a member of the Commission to Counteract Attempts to Falsify History to the Detriment of Russian Interests.